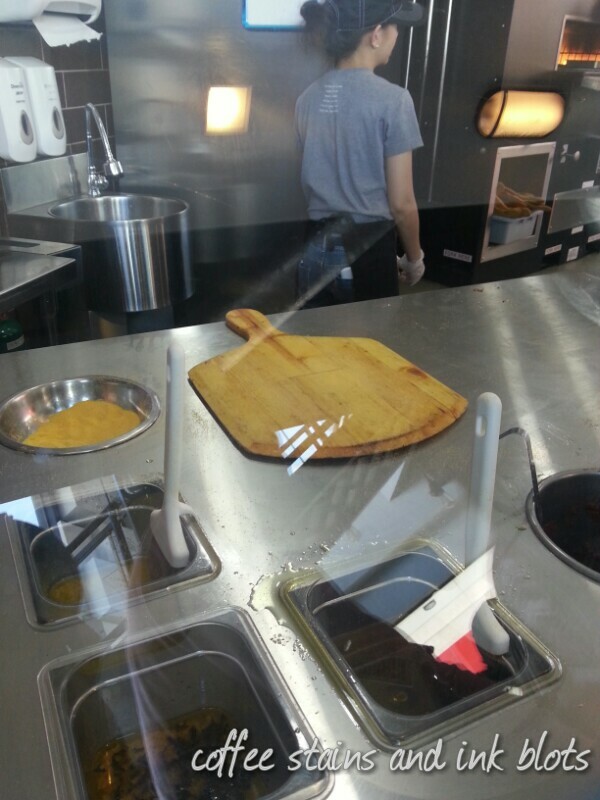 one of the food fad these days is how they let the customers customize the food however which way they want it. 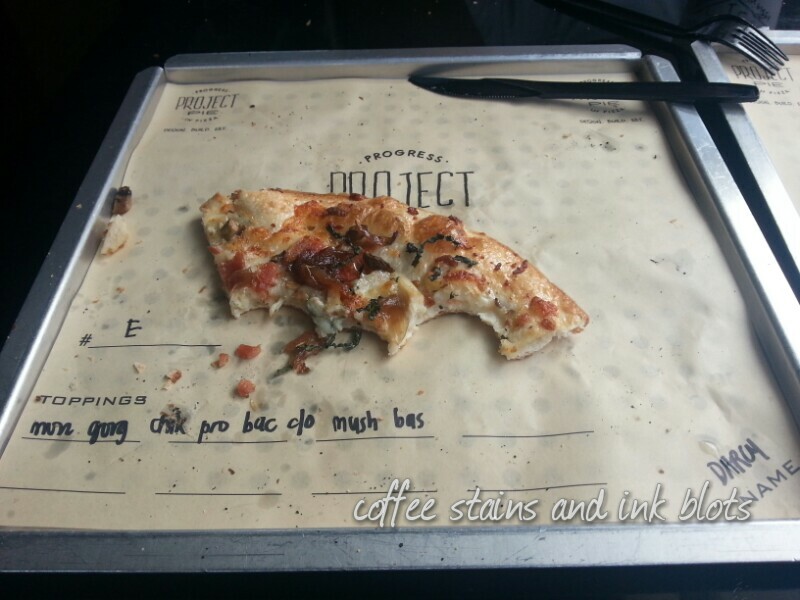 project pie is an artisan-inspired create-your-own-pizza place. several branches have already sprouted around the metro and i was very eager to try it out. finally, hubby and i were able to go to the alabang branch. we went on an “off-hour” so the long queue of people was not there. plus we had the luxury of choosing where we wanted to sit. we chose a couch by the window on the second floor. so how do you order? 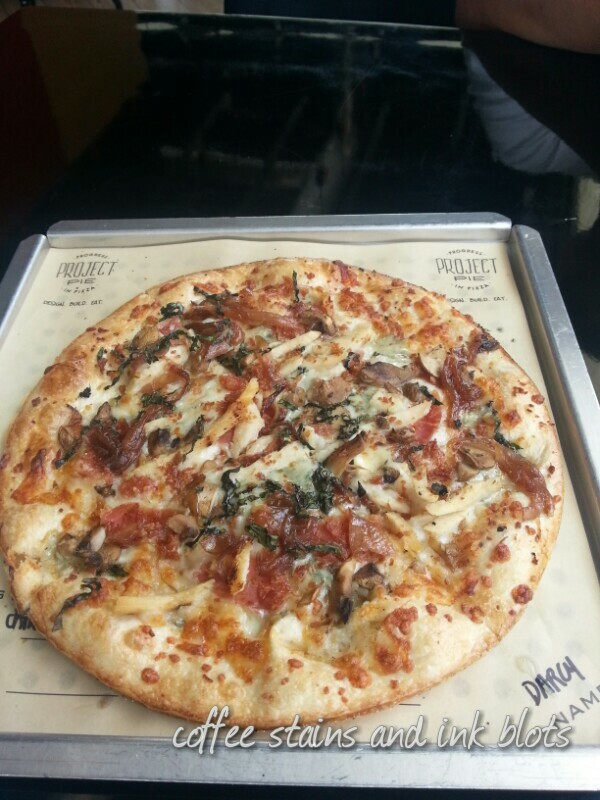 line up and decide whether your having their signature pizzas (php 245.00) or build your own (php 285.00). they have 7 signature pizzas, both red (wit tomato sauce) and white (olive oil based). 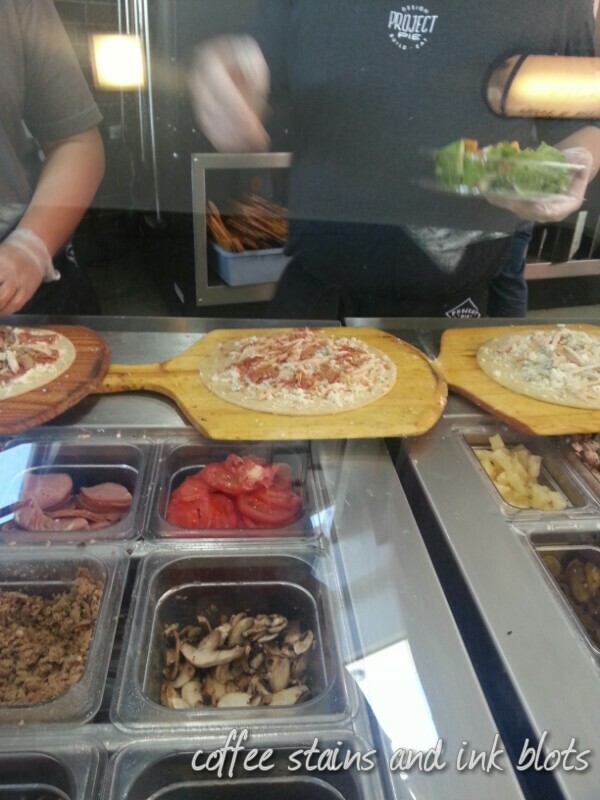 if you choose to build your own, you will be then asked for your toppings as you go through the line, and then your pizza will be put in the oven. when your pizza is done, you will then be called so that you can claim it. available pizza toppings: mozzarella, feta, gorgonzola, ricotta, parmesan, pepperoni, italian sausage, crumble meatballs, bacon, grilled chicken, canadian bacon, prosciutto, anchovies, red onions, green bell peppers, jalapenos, cilantro, roasted red peppers, tomatoes, caramelized onions, fresh mushrooms, garlic, rosemary, pineapple, artichokes, fresh chopped basil, black olives, pesto, bbq sauce. since we wanted the “full experience” we went ahead and decided to build our own pizza. we went for a white pizza. the dough starts out as a ball, then a machine flattens and shapes it. then sauce, or in our case, oil is put on top of it. you will then be asked what cheeses you want. i chose mozzarella and gorgonzola. 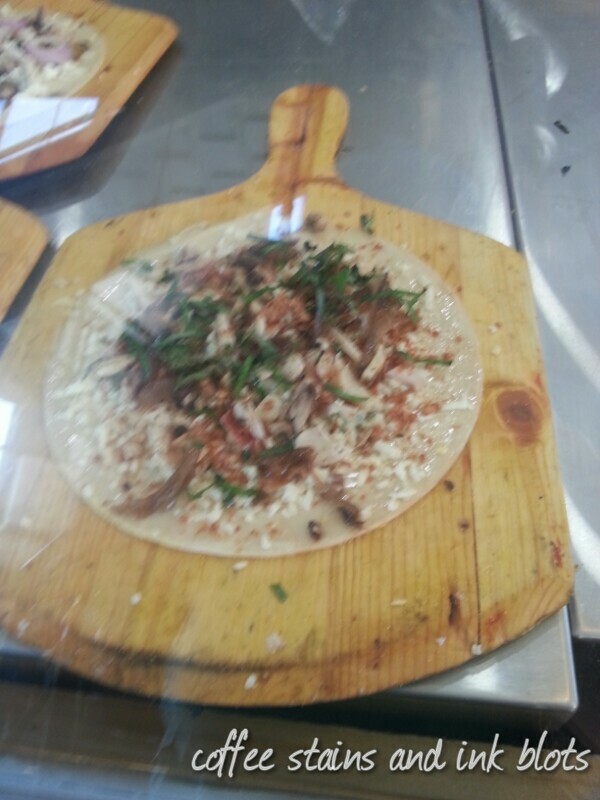 and then we added fresh mushrooms and caramelized onions to balance the flavors. i also requested for fresh chopped basil. then in goes our pizza to the oven! i loved the flavors of our pizza (of course, i created it! :P) the sweetness of the caramelized onion balanced the saltiness of the meats and the gorgonzola. plus a hint of freshness care of the basil. we also ordered a classic caesar salad (php 165.00) to go with our meal. 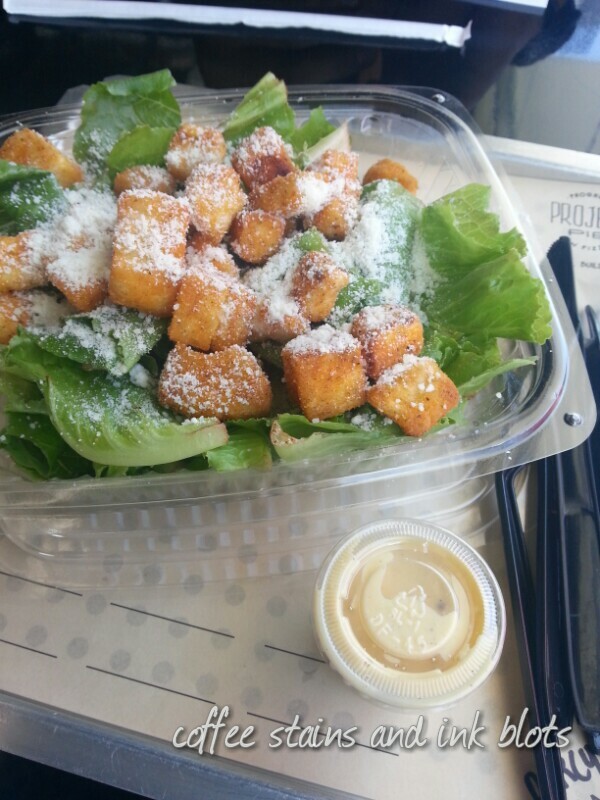 the salad had romaine, parmesan, croutons and caesar dressing served on the side. i super like the croutons since they are cheese flavored, it’s like eating cheese curls. 😉 i got water while hubby got the soda. there are a couple other salad you can order, and also dessert pizzas – banana nutella (php 145.00), peanut butter nutella (php 145.00), strawberry mango nutella (php 195.00), cinnamon sugar with icing (php 145.00) – which i plan on checking out next time. 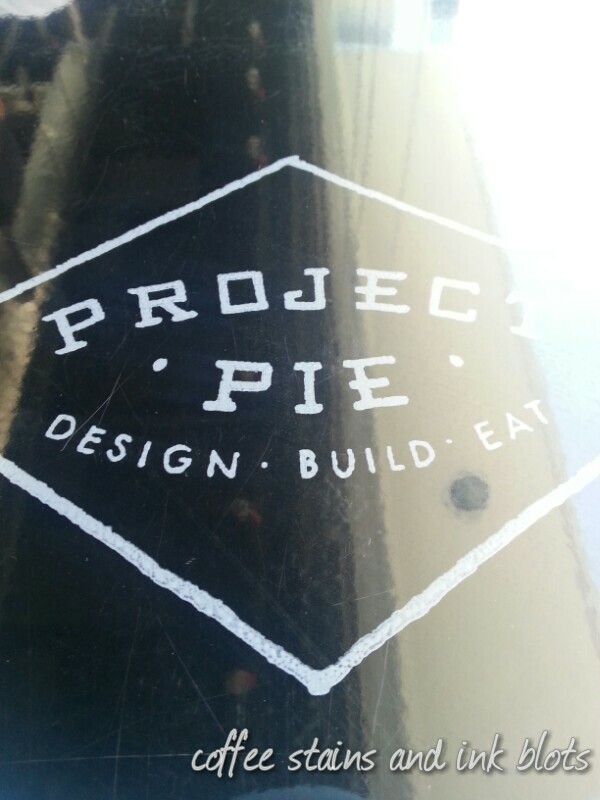 overall, i enjoyed eating at project pie. we shared one pizza and a salad for lunch since we were still a little full from earlier, but i think one person can finish one pizza. 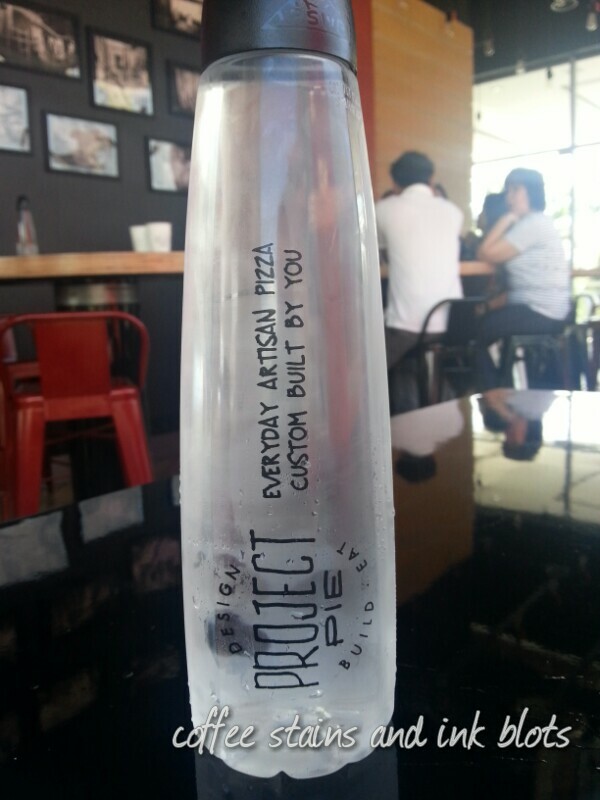 it was a nice experience and it’s likely that we will visit again to try out other pizza flavors.